Mr. Random.org was certainly having fun this morning as I tried to come up with a winner for the blog hop contest. The first 3 picks were members of the Design Team and pick #4 was Pam, the owner of Red Rubber Designs. Finally after 4 tries, the 5th attempt gave me a legitimate winner. Keep reading to see who won. The contest this month was a random draw from all of the comments on the "mystery" blog. The "mystery" blog is that of Diana - Wordbirds Nest. 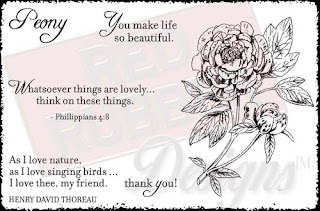 The winner will receive the Lovely Peony stamp set that was featured in the blog hop. This timely set Support the Girls is also available at a 40% discount. How can you pass up a deal like that! Okay, now that you have made it through the infomercial, it is time to announce the winner. Congratulations, Stacy. I know that you will be making beautiful art with your new stamp set.